Features Hybrid circuitry that delivers 75 single-ended watts; use of wood and stainless steel make for a gorgeous-looking product. Use Amps are rather large and run very hot, so youll need a lot of room for them; sound their best after two hours of warm-up. Value A more refined version of an already terrific product that comes at a premium, but those who want the best will spring for the BC2.1s. Large, hot, heavy and unconventional, Blue Circle Audios BC2 mono amplifiers are components that, after I first heard them, I simply had to own. After I wrote a review of the amps, I put my money where my mouth is and bought them. That was roughly two years ago. Whats unique about this situation is that since I bought the amps I have not even been tempted to trade them in. How many audiophiles can say that? Not many I know. In fact, I couldnt either until the purchase of the BC2s since I had been like a dog chasing my own tail, upgrading every few months. The BC2s unique design and splendid sound mean theyre here for the long haul, as I suspect they are at many other owners homes. Despite my praise, I cant say the BC2s are the best amplifiers you can buy. Surprising? Not really -- there are a few reasons. First, it is easy to find more powerful amplifiers that will drive even the most ornery loudspeakers. Second, I have heard amplifiers that have certain sonic aspects that are better than what the BC2s do. However, I havent found any one amplifier that Ive found as satisfying overall. Finally, I dont think there is any one amplifier on the market today that could be called the best. Whenever someone proclaims an amplifier as the best, he should qualify it as one of the best. One persons definition of the best is likely not going to be the same as another persons, and we all know what kind of effect speakers can have on an amplifiers performance. So the BC2 monoblocks are one of the best amplifiers Ive found, and it is going to take one hell of a special amplifier to make me want to part with them. That said, I must admit that when Blue Circle Audios president Gilbert Yeung told me about the BC2.1, I had to wonder if, indeed, that special amplifier had arrived. From the outside, the BC2.1 is identical to the BC2, save for the addition of a ".1" on the stainless-steel faceplate. There is the same enormous hardwood chassis with heat sinks running the length of the top and Cardas binding posts on the back. The amplifiers power on identically with its glowing Blue Circle logo, muting for a number of seconds until a final click indicates that theyre ready to make music. After the warm up, these amplifiers run HOT! Prospective listeners take note -- both amps take about two hours of warm-up to sound their best. They are designed to sit on the floor and need plenty of space around them. On cold winter nights they double as space heaters. In terms of appearance and their very hot operation, these are not the amps for everyone. Audiophile esoterica is what I deemed them in my original Blue Circle review, and they still fit that description today. Both the BC2 and BC2.1 are available in a variety of wood finishes including black oak, satin black, golden oak and red cherry. 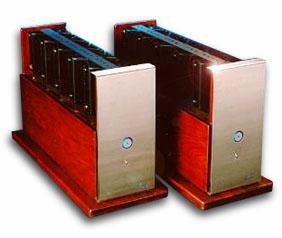 Both the BC2 and 2.1 amplifiers are 75Wpc pure class-A single-ended designs. They are unique in that they are a hybrid design employing a vacuum-tube input stage with bipolar-transistor output. Delivering 75 watts into 8 ohms, they are sufficiently powerful to drive most reasonably efficient speakers on the planet, but some care must be taken if driving a speaker with too low an impedance or with some other anomaly. In my two years with over a dozen loudspeakers tried and tested, I havent found a speaker that the amps dont like too much, and Gilbert Yeung, the company president, uses the amps with Martin Logan CLS loudspeakers, a notoriously tough load. Blue Circle has been proud of the BC2s simplicity of design; it doesnt make sense, then, to take an effective circuit and potentially destroy what it does well by making it unnecessarily complex. Therefore, the BC2.1 is not so much a different amplifier, but a more refined BC2 -- and with a price tag of $9800/pair compared to $6300 for the BC2s. Dont go screaming if you bought a set of BC2s. Any BC2 purchased now, or before, can be upgraded to a BC2.1 for the identical difference in retail price: $3500. Inside the BC2 and BC2.1 amplifiers look similar, but are not identical. According to the Blue Circle folks, the difference between the 2.1 and the 2 includes the use of high-speed switching capacitors in both power supplies; high-voltage filtering that has been increased by 100% and low-voltage filtering increased by over 30%; Hexfed ultra-fast soft-recovery diodes used in both power supplies; and true film and foil capacitors used in the entire signal path. Finally, they have kept the fuse on the BC2.1 amplifier output for safety reasons, but have found a better implementation that supposedly improves the amp sonically. I used the BC2.1s in my reference system consisting of a Theta Data Basic transport and Theta Pro Prime II DAC (using a Camelot Dragon Pro2 Mk II jitter reducer and Nirvana Audios Transmission Digital and T-2 Digital cables), Blue Circle Audio BC3 Galatea preamplifier, Nirvana S-L series interconnect and speaker cables. There were a number of speakers employed, including the Merlin Music Systems TSM, Cliffhanger Audio CHS-2/W-2, NSM Audio Model 5, NSM Audio Model 10S, and Shamrock Eire. In a nutshell, the BC2.1 sounds very close to the BC2 -- not surprising given the BC2.1 is, as I mentioned, a refinement of the BC2. Since the two are so similar, I can first generalize. I find them both to have what I would call a romantic sound. In more descriptive terms this means they have deep, authoritative bass performance -- no, not the tightest or quickest, but they plumb the depths like no single-end amps I know except perhaps for Lamms amazing ML2. Upper bass to lower midrange is smooth and highly detailed. The midrange is not pushed forward or bloated, but is smooth and exceedingly natural. Vocals are reproduced with uncanny realism. The high frequencies are extended, but are never hashy, edgy or harsh. The BC2 and BC2.1s are great amplifiers due to the fact that even though they may not be the best at every individual thing, they are extremely good across the board. And more importantly, and whats nearly impossible to describe but simply must be heard, is how these amplifiers deliver the music, regardless of style, with unusual ease. In a word, these amps sound extraordinarily natural, and this makes long-term listening -- over years -- easy. Where the 2.1 improves on the 2 is what I would call a subtle top-to-bottom refinement. There is nothing big that leaps out at you or makes you jump from your seat proclaiming "Uh, huh, theres the difference!" There is a subtle but meaningful improvement to the overall sound. Tonal balance and frequency extension remain the same. The highs are just a tinge sweeter with perhaps a tiny bit more air. The bass is just a notch tighter with a smidgen more detail. And the midrange, which is the most noticeable area of improvement, is just a tad more liquid. Vocals, particularly female, are placed with better focus in the middle and seem to have just a little more presence and what some call palpability. A little more detail seems to pass through the BC2.1, most noticeably things like hall ambience. Good classical recordings that catch the sound of the venue along with the musicians make this most apparent. As a result of these improvements, microdynamics are improved, giving a slightly quicker sound, and soundstaging, already extremely good, is improved in terms of imaging specificity and depth. I dont want to overstate these differences because they all are, in fact, very subtle. Casual listeners, or those without revealing enough loudspeakers, wont likely notice too much a difference at all. For those who know the BC2s well and have a very revealing system, the resultant differences will make a meaningful improvement. A refinement of an already outstanding amplifier begs the question, "Is it really worth it?" That, of course, depends on your point of view and personal circumstance. A not insubstantial $3500 for the difference in price between the two amplifiers is certainly worth considering. A better CD player or even speakers could also be considered as an alternate purchase. The fact is, its no secret that at this price point diminishing returns set in very strongly for electronics. As the price goes up, sound quality may improve, but at nowhere near the same rate. For a 50% price increase, you do get the commensurate level of improvement, but in this case you definitely get something better. On the other hand, its easy to understand the market for the BC2.1. For those who must own the best of a breed and who have the monetary means to get it, the BC2.1 will likely be the end of the road because it is, in fact, just that wee bit better than the BC2. Whats comforting in all this is the fact that your BC2 can be upgraded to a BC2.1 for the same cost as the difference in retail price. Whatever your choice, you wont be out, and either way youll have outstanding amplifiers as the heart of your music system. Price: $9800 USD per pair.